HP Umpire Angel Hernandez ejected Mets SS Asdrubal Cabrera (time-not-granted call) in the top of the 4th inning of the Mets-Nationals game. With one out and none on, Cabrera requested "Time" during a 3-1 pitch from Nationals pitcher Erick Fedde, resulting in a called second strike when Hernandez subsequently denied Cabrera's request. Cabrera ultimately hit a single on a line drive to right fielder Bryce Harper and was ejected for arguing the "Time" issue while at first base. Replays indicate that Cabrera requested time out while pitcher Fedde was already into his delivery as in Rule 5.04(b)(2), the denial/call was correct. * At the time of the ejection, the Nationals were leading, 1-0. The Nationals ultimately won the contest, 1-0. This is Angel Hernandez (55)'s first ejection of Spring Training, the 2017 MLB preseason. Angel Hernandez now has 0 points in the UEFL Standings (0 Previous + 0 Spring Training = 0). Crew Chief A Hernandez now has 0 points in Crew Division (0 Previous + 0 Spring Training = 0). A similar play and denied request from 2013. *Rule 5.04(b)(2) states, "The batter shall not leave his position in the batter’s box after the pitcher comes to Set Position, or starts his windup." 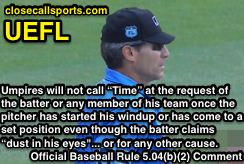 *Rule 5.04(b)(2) Comment states, "Umpires will not call 'Time' at the request of the batter or any member of his team once the pitcher has started his windup or has come to a set position even though the batter claims 'dust in his eyes,' 'steamed glasses,' 'didn’t get the sign' or for any other cause." "Umpires may grant a hitter’s request for 'Time' once he is in the batter’s box, but the umpire should eliminate hitters walking out of the batter’s box without reason. If umpires are not lenient, batters will understand that they are in the batter’s box and they must remain there until the ball is pitched." Reason for Rule 5.04(b)(2): Preventing injuries, like this one sustained by Johnny Cueto in 2012. Case Play Note: If the denied "Time" request disrupts the pitcher's delivery, "the umpire shall call time and both the batter and pitcher start over from 'scratch.'" 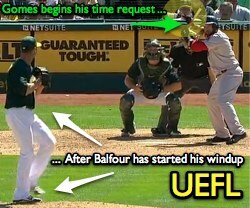 More: Starting From Scratch - Batter Disrupts Pitcher's Delivery. This is the seventh ejection report of Spring Training 2017. This is the 5th player ejection of 2017. Prior to ejection, Cabrera was 1-2 in the contest. This is NYM's 1st ejection of Spring Training, T-1st in the Grapefruit League (HOU, NYM, STL, TB 1). This is Asdrubal Cabrera's first ejection since June 22, 2015 (Kerwin Danley; QOC = Y [Balls/Strikes]). This is Angel Hernandez's first ejection since July 19, 2016 (Brian Snitker; QOC = Y [Balk]). Wrap: New York Mets vs. Washington Nationals (Grapefruit), 3/23/17 | Video via "Read More"